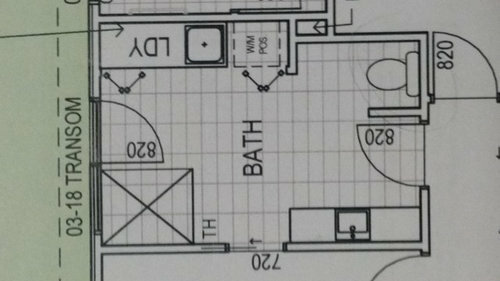 We’re planning for our new home to have a combined bathroom/laundry that is accessible from the hallway, connects to the backyard via a hinged door opening inwards and also connects to the guest bedroom via a sliding door (we want the doorway to be 820mm not 720mm as currently shown). 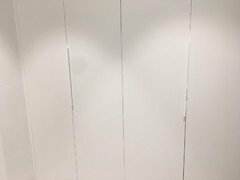 The space has 2 different widths - 2960 at its wider end and 2660 at the narrow end and is 4120 in length. So far, we’ve only been able to come up with the plan below, but there’s no wall space for towel rails and a lot of vacant space in the centre of the room. Overall, it just doesn't seem like the best solution. Is there some way we can improve on this design – we’ve been wracking our brains to no avail and would love some expert advice! That's a brilliant use of space oklouise - thankyou! You're right about seeing the room in context, so I hope the image below helps. As you can see, the small space has been set aside for plumbing. 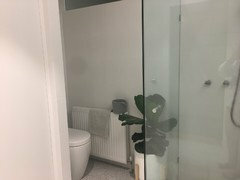 We wouldn't be able to have a window to the shower as shown on your plan, but I'm not sure if that's an issue anyway ( we don't have a window in our current unit bathroom). I like the added privacy provided by the separate zones too. Hi Mattwenn, in my opinion, a design along the lines of oklouise would be the better plan. In your current plan, if someone is using the toilet or shower, you can not access the laundry facilities. Also, I as a guest, would feel uncomfortable sitting on the toilet with three doors that could open suddenly. With oklouise design the bathroom is separate from the laundry and can be used individually, without embarrassing consequences. Sorry I should have explained more clearly, the third door has been removed, which was a waste of space into a small area and if using the toilet the sliding door, or not, between the powder room vanity and toilet can be locked, as can the entrance to avoid any unexpected surprises Without knowing if this is actually a family bathroom and how many will live in the house. I also like Oklouise idea . I'am just offering Matt another solution that he might like to consider which could suit his family needs, it's up to him, as they say there's more than one way to do things and we all live differently. 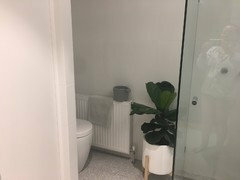 Hi dreamer, yes, the lack of privacy and access when the laundry or shower/WC areas are in use is a big downside to this design, so a new design would have to take this into consideration. Thanks for sharing your views - all grist for the mill as 'they' say! Thanks siriuskey for your design and comments. A bit of background would no doubt be useful, so apologies for this late addition to the discussion. The house will accommodate a reasonably fit and active retired couple in their 60s (us!). 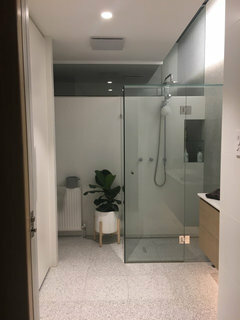 We have elderly Mums and expect that 1 of them will end up moving into the guest room/study (hence the desire to have a connection between this room and a shower/WC). We'd also like to be able to access the backyard and have visitors able to access the WC - although we accept that at times we can't have everything...although it's worth a shot! We've struggled with the layout of this space for some time now and picked our builder's brains, but so far no-one has been able to come up with a solution. Both oklouise and you prove that other options are out there. Another idea, still trying to eliminate the 3rd door into that space for more privacy, which will help stop surprises, as the original plan a door opening directly into the bath from the study bedroom could cause a problem, as I mentioned I also don't like the entrance into the bathroom laundry coming in from the passageway next to the master bedroom, once a again noise and things that go bump in the night and I hopefully don't mean mother. have both the washer and dryer under bench with just a sink and wall cabinets which extend to a hanging rack in front of the window. Ensuite is quite large. 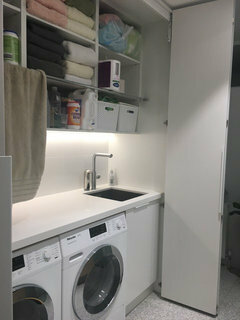 Trim it back to allow a separate laundry, probably also get more cupboard space too with a little bit of rework. You're not trimming much space either say 300-450mm. Still end up with a more than generous shower. 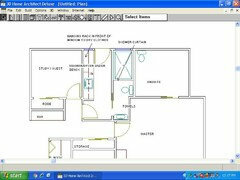 Relocate master bedroom door a bit perhaps, designer will be able to sort it pretty quick. 1. 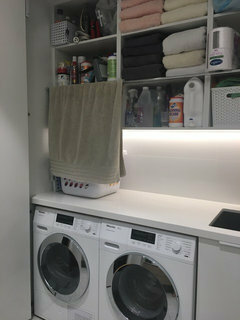 Could the laundry go into the space where your storage cupboard is in the hallway? Washing could be taken outside via the patio door. 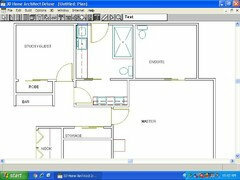 You could then recreate a large storage cupboard where the current doorway is and the toilet. You would reposition the door to the far left. 2. Close the access to the backyard and where your laundry is relocate a large vanity. You then can place towel rails between the vanity and the shower. 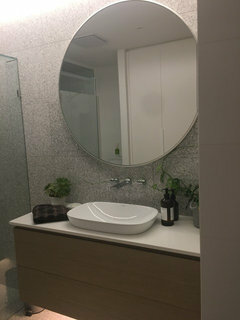 The toilet can be positioned on the right hand wall in line with the vanity. Sorry I don't have access to a design program so hopefully you are able to picture this. Or you could actually leave the toilet where it is and just put a linen cupboard where you currently have the vanity. 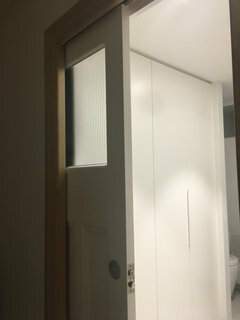 Get rid of all those doors make them Joey doors ie sliders into stud wall cavity saves so much space. Hope this helps we have an en-suite on the other side ( not pictured)our house is a Edwardian SINGLE fronted house space is premium. My architect didn’t think of the Joey door I did!!! As you can see the toilet is hidden I leave the Joey door open when not being use it is such a nice room to walk past we have a skylight that runs along the witdth of the 2 bathrooms to the hallway. HELP please on kitchen, laundry, add bedroom. 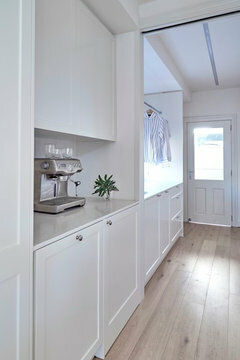 Linen and store ideas, desperate for help with the laundry design etc.